So, to conclude my long-winded series of posts about Charlie’s Harry Potter birthday party, we will be dealing with one of the most crucial elements: the food. 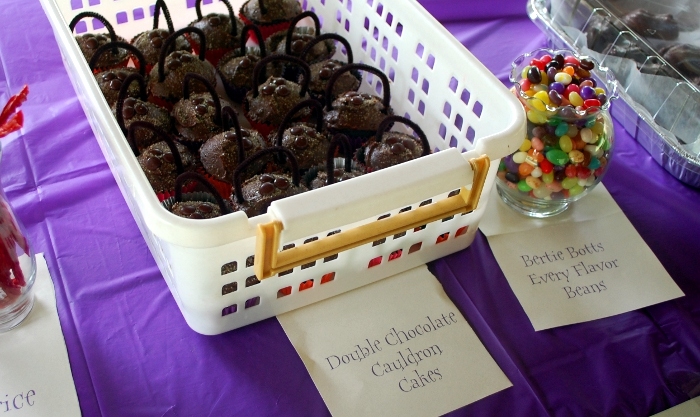 Ask any kid who’s requested one and you’ll hear about Chocolate Frogs and Bertie Bott’s Every Flavor Beans. It’s inevitable. Here’s what we did. 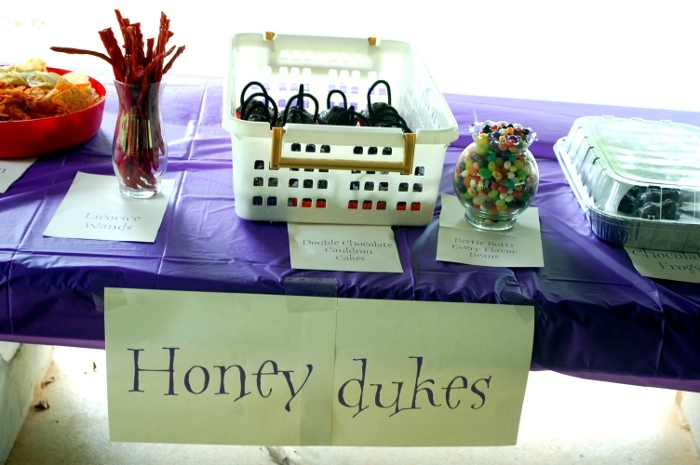 Unlike Diagon Alley and Hogwarts, Honeydukes had a purple tablecloth to go along with its sign. We also used yellow tableware, to keep with the magical feel. 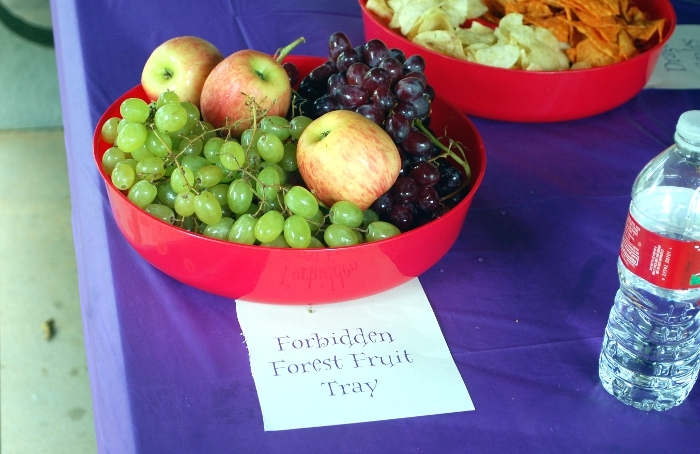 We made signs for all the food items – that’s half the fun, after all – using the free font Hogwarts Wizard. 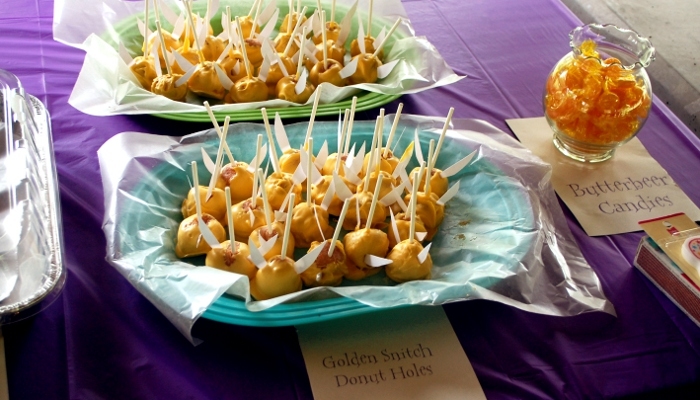 We also had Golden Snitch Donut Holes (I was going to do cake pops but decided to be realistic: just poke donut hole with a lollipop stick, dip in melted yellow candy melts, and skewer with wing-shapes cut from cardstock before the candy hardens. Easy and impressive!) and Butterbeer Candies. Any kind of butterscotch candy would do, I like these because of their plain yellow wrappers. 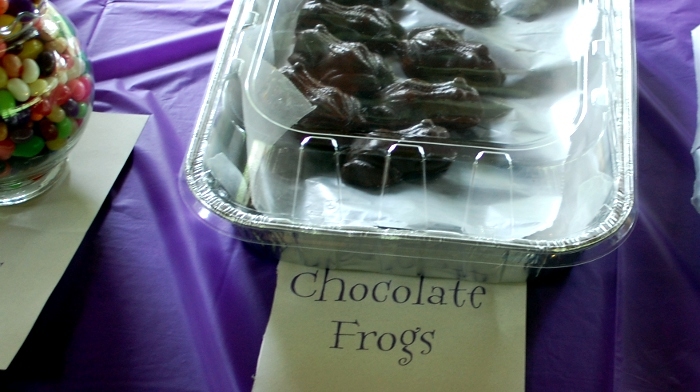 Finally, there were the Chocolate Frogs. I wish I had a better picture of these, but I don’t! We decided to make marshmallow filled ones, because we were using almond bark. I don’t know if you’ve ever tried to each a solid chunk of almond bark…it’s not so good. There’s a tutorial here, we didn’t color the marshmallow creme green and I used a different mold than she did but they turned out SO AMAZINGLY! I loved them! It was the first time I’d ever made molded chocolate, and it was SO easy and SO impressive and SO fun that I am dying to do some more. Maybe for Christmas, we’ll see. Well! That was the party! 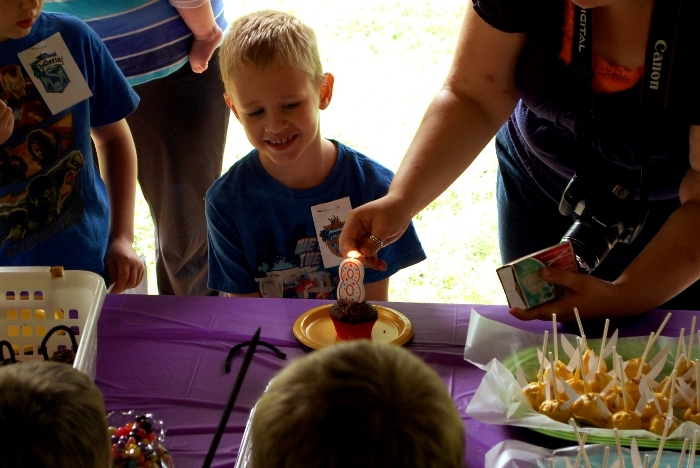 It was a ton of work, but it was an absolute blast for us and for the kids, and what more can you ask than that? 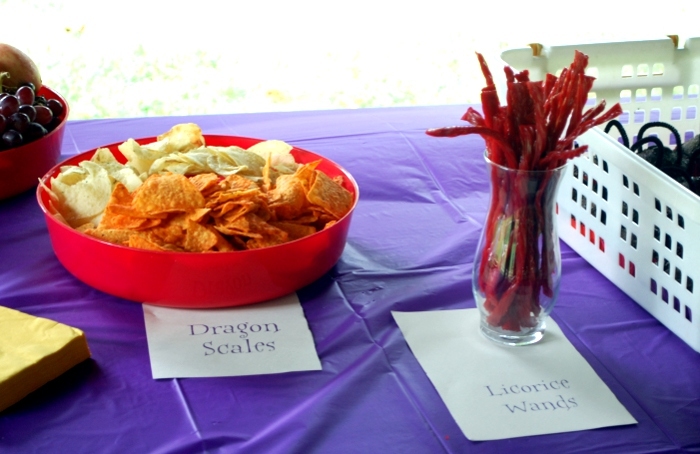 Looking for more on the Harry Potter Party? Check out these links! This entry was posted in How To, Other Projects, Recipes.